How can I retrieve data from my old hard drive? My HP Vista computer crashed. Geeks advised it was a bad “motherboard”. Got a new computer. Bad mistake, I did not back up hard drive. How can I retrieve data from my old hard drive? I placed my old hard drive with XP Operating system to my new computer with Win 7 Ultimate OS, and I'm trying to retrieve files from my old hard drive but I can't access it because i'ts giving me a message"you don't have security permission" Whats the right procedure to retrieve the files? I am having the same problem. I connected the laptop hard drive with and external drive enclosure via USB hub to the new laptop. I am not able to access all the files. Please let me know how to change the file ownership. you should post this as a new question. Please be as specific as you can regarding which files (certain folders or file types?) that are not accessible. Also mention with which file system the hard drive was formatted initially (Fat32 or NTFS) and what operating system are you using. There is something else to keep in mind. When you connect your old primary hard drive externally or as a secondary drive not all of your the files might be available. You may have to change the file ownership before you can access some of the folders. If you're not able to access all of the folder after you connect the drive please let us know here and we'll gladly guide you through the process of changing file ownership. If it was the motherboard that was faulty, I don't see how your hard disk data could be effected. In that case, simply attach your old hard disk to your new computer and voila! If opening your case is not something that you are comfortable with, you should try using a SATA to USB or IDE to USB converter. If you don't have a geeky friend that knows about computer hardware, I think this guy can help. In there, he explains how to remove the hard drive from your laptop and connect via USB to another computer so you can see the old hard drive's files. If it was a desktop computer, then read here and here. 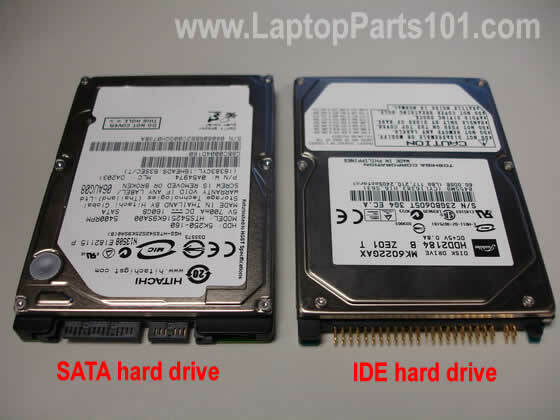 Just remember, if you're going to get an enclosure/case for your hard drive, get one that's 2.5 inches if your Vista computer was a laptop; otherwise, if it was a desktop computer, 3.5 inches case. As far as whether you should get one with SATA or IDE connector, here's a pic.